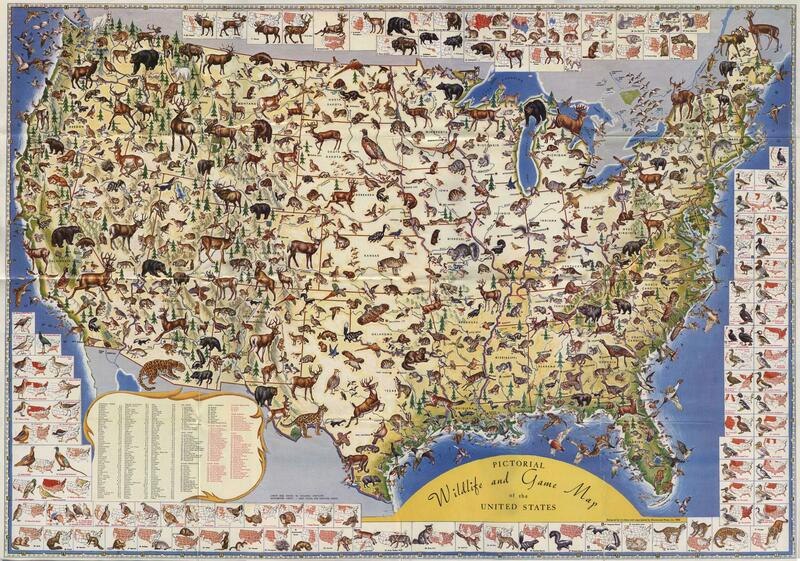 Images of this 1956 Pictorial Wildlife and Game Map of the United States have been kicking around the Internet for a while now. It caught my eye when I first saw it, but I’ve been pondering just why I find it so intriguing. Sure, it’s picturesque and pretty. It harks back to a cheery era of view of land and environment that pre-dated the current changes in biodiversity. Or rather, it pre-dated the deepening knowledge and understanding of what those changes mean. Recent biodiversity studies are showing that while the quantitative amount of species might be fairly constant in a given region, the composition and quality of those numbers are undergoing rapid alteration. More species of algae and invertebrates, for example, and fewer of birds and mammals and corals. The 1956 map doesn’t just show a wide variety of iconic mammals and birds, it shows them in an array of overwhelming plenty. And I think this starts to get at what I find so interesting. Small or large, mighty or modest, posed as if poised for action, the entire map is packed with more animals than any one person could ever track or hunt or witness. Except that, really, it isn’t. Fifteen animals listed as ‘big game’, most of them bears. Another fifteen animals as ‘small game’, with several squirrel and rabbit types, followed by fifteen ‘animal predators’, mostly foxes and skunks. Then a scattering of small mammals and lots of birds. And yet, it looks like an overabundance, a certainty that bounty always has and always will exist. And maybe at some point, it was. This older map doesn’t concern itself with the mammals that might be found almost anywhere, at least in a related species. Map of the Animal Kingdom, circa 1835. No squirrels or pigeons here, just the big guys. Jaguars and camels, black bears and bison, the iconic creatures that might nourish us, serve us, carry us, or eat us. Again, though, there’s the static certitude that if one were to visit a region, one would find the animals as shown. And then there’s this new map that shows both our changing attitudes towards animals as well as towards mapping. California Roadkill Observation System. The map can be configured to search for a number of different species, and for specific time frames. This version is a screenshot of the past 90 days. Visitors can add their own observations to the database. The California Roadkill Observation System is an interactive cartography project that dates back to 2009, and it charts ongoing instances of roadkill in California. Anyone can take a photo of an animal killed on California’s roads, and upload it for inclusion. This grim diary serves several purposes. One is to show what kinds of animals are present in a given region, and to a certain extent, how abundant they are, i.e. the health of the population. For instance, the project has documented a general decline in wildlife roadkill over the course of the California drought. UC Davis professor Fraser Shilling, who operates the database, calls it a ‘continuous wildlife sampling device.’ It can offer information on invasive species, such as the westward movement of the Eastern grey squirrel, at least where their presence intersects with motorized human mobility. It’s not as visually arresting as the 1956 map, but it does something that older maps can’t: Show the movement and abundance of life on the ground. It carries no inherent optimism or promises, just the acknowledgement of change on the ground, and an invitation to awareness.